It's publication day for Maddie Dawson and The Survivor's Guide to Family Happiness! Newly orphaned, recently divorced, and semiadrift, Nina Popkin is on a search for her birth mother. She's spent her life looking into strangers' faces, fantasizing they're related to her, and now, at 35, she's ready for answers. Meanwhile, the last thing Lindy McIntyre wants is someone like Nina bursting into her life, announcing that they're sisters and campaigning to track down their mother. She's too busy with her successful salon, three children, beautiful home, and ... oh yes, some pesky little anxiety attacks. But Nina is determine to reassemble her birth family. Her search turns up Phoebe Mullen, a guarded, hard-talking woman convinced she has nothing to offer. Gradually sharing stories and secrets, the three women make for a messy, unpredictable family that looks nothing like Nina had pictured...but may be exactly what they all need. I enjoyed how different the two sisters were. Nina, desperate to fill the void left by her adoptive mother, was so carefree about all of the major events happening in her life - moving in with her new older boyfriend, meeting her sister, finding her birth mother, etc. And Lindy seems to have it all, but is balancing everything in such a way that she can't help but constantly feel anxious. These women are clearly destined to save each other, and I loved that. The Survivor's Guide to Family Happiness wasn't a book I felt pulled to as I began it, but I enjoyed the story whenever I was reading, and it captured my interest more and more as I continued. The author's writing was both witty and heart-warming, and made for a book that was very easy to read. The main message I take away from this novel is that if we refuse to accept rejection and open ourselves to new possibilities, our lives could change in the most unexpected and amazing ways. "So this was love, I had decided. Sometimes you just have to make up your mind to let it in." You can connect with Maddie Dawson on her website, Facebook, and Twitter. 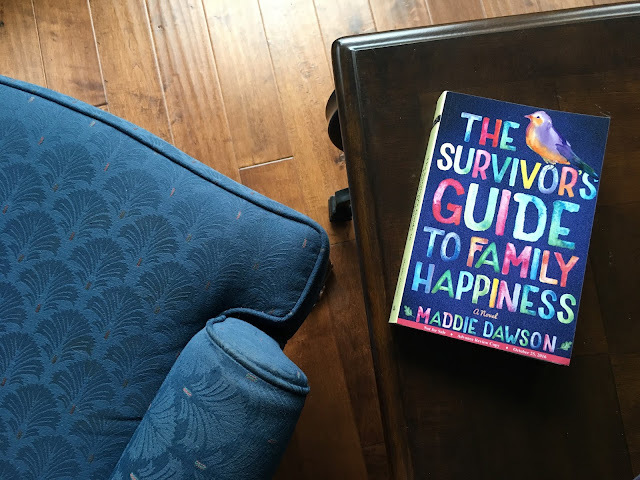 Thanks to Maddie Dawson, TLC Book Tours, and Lake Union Publishing, I have one copy of The Survivor's Guide to Family Happiness to giveaway. Disclaimer - I was sent a complementary copy of The Survivor's Guide to Family Happiness from the publisher and TLC Book tours. All thoughts and opinions are entirely my own. To see what other bloggers had to say about this book, you can check out the full book tour here.